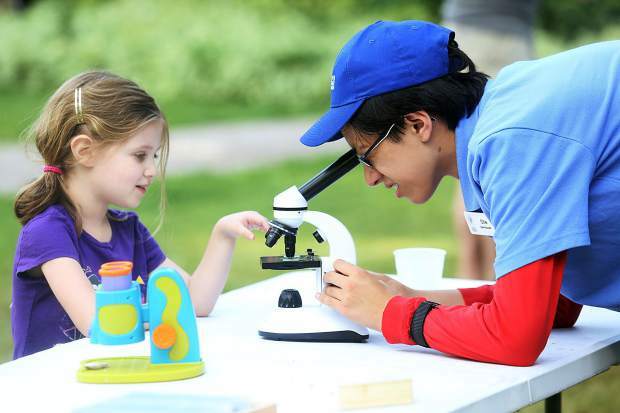 Aspen Science Center intern Ollie Thakar, right, adjusts the microscope for Eleanor Greenbaum, 5, during the Physics for Kids barbecue on Wednesday, July 25, 2018, in Aspen. Now in its sixth year, the Aspen Science Center’s Intern-Educator Program has its largest group yet and this year is giving nine high school students the opportunity to spread their passion for science to children throughout the community. This summer, students from Aspen, Basalt and Glenwood high schools along with Colorado Rocky Mountain School and the Park School of Baltimore are sharing their knowledge. Of the nine, four interns are back for a second or third year with the program. The program’s growing popularity has allowed the center to increase its selection of educational scientific programs over the past five years. The record number of interns working this summer directly coincides with the addition of new programs. “We added more programs this year, so we knew we were going to need all the help,” Aspen Science Center president David Houggy said. Having more interns not only allows for more programs, it also “brings more perspectives on science,” said Oliver Thakar, a senior at the Park School of Baltimore. Thakar, in his second year with the program, has a passion for teaching and plans to become a professor one day. Interns are paid for their work, which includes helping to organize and run summer programs, creating new scientific activities, setting up before events and cleaning afterward. They are involved with programs such as Physics BBQs and the Summer Science Fair. Training includes teaching interns how to work with children and ensuring that interns thoroughly understand the field of science. Other benefits to being a science intern include opportunities to meet professional scientists, mathematicians and engineers; to learn and teach new scientific topics; to gain experience planning and executing events; and to impact children, which can be very rewarding. “Whenever you’re doing an experiment in front of a kid, and they’re answering all your questions, and then you just see their face light up when they realize what’s going on and they’re like, ‘Oh my God I understand this!’ That’s awesome. You just taught someone something that they’ll hopefully remember for a really long time,” said Aspen High School senior Donovan Bronstein. This is Bronstein’s first year as an intern, and he said his work as an intern has solidified his desire to have a career in a scientific field one day. Last year, intern-educators had the opportunity to develop a new scientific activity or demonstration to be presented at one of the summer programs. It is now required for interns to prepare at least one demonstration, but they can do more. “We really want it to be something where they also have some responsibility and some intellectual creativity,” Houggy said. This aspect of the program challenges intern-educators to think of something original and gives them valuable scientific experience. Interns have the chance to delve into a scientific phenomena that fascinate them through creating their demonstration. The process of preparing the demonstration also requires them to work out the logistics of how best to clearly present their ideas to children. Giving children the opportunity to learn about a wide variety of scientific disciplines helps them discover what they are most interested in, Houggy said. The interns’ demonstrations cover fields from biology to geology to mathematics. Houggy hopes to expand programs to more areas of the Roaring Fork Valley and to offer after-school programs. In order to achieve that, the intern-educator program will grow exponentially.